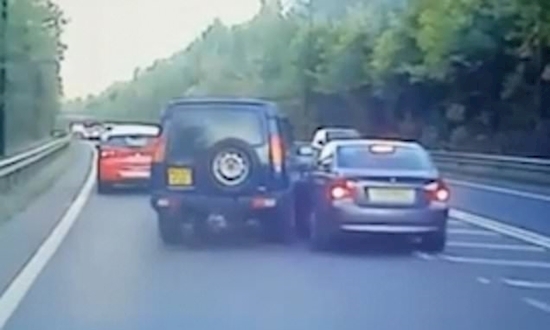 Dramatic video shows the moment a Land Rover Discovery driver rammed into another car as it tried to merge into the same lane - by cutting ahead of the SUV. The Discovery driver decided to play dodgems with the silver BMW while both cars were moving in slow traffic on the A57 near Sheffield. The 4x4 had been allowed to merge into the left-hand lane by a vehicle behind, which recorded the shocking moment on dash cam. But when the BMW tried to get ahead of the queue it was barged into by the Discovery driver. The clip, which was captured on Tuesday evening, shows slow-moving traffic merge from two lanes to one. Richard Booth shared it on his Facebook page after it was sent to him on social media by an unknown dashcam user. The video shows the Land Rover Discovery in the right hand lane as it slowly begins to veer into the left hand lane. The car behind, which is filming the incident on a dashcam, is happy to let the Discovery in. But when the BMW tries to get in ahead, the Discovery driver accelerates to block it off. When the BMW driver makes a second attempt to join the lane, the Discovery driver uses his vehicle as a battering ram to stay in front. The clip ends as the BMW driver puts on his indicator and pulls off the road. It remains unclear what, if anything, then happened. The video posted by Richard has received over 185,000 views and has left many people on social media angered by the incident. Ben Eades added: 'BMW did nothing wrong. People who think he did need to learn to drive. It's a filter lane'. James Gee Pemberton wrote: 'Guarantee this is one of the b***bags who sit in the right hand lane purposely going slow! See this almost every other day there...such idiots on the road'. But Adrian Grice attacked the BMW driver, writing: 'Join queue like every other person simple. 'K***heads go right to the end with a smug smile and expect to be let in. F*** that have a bit of respect for other people (never rammed anyone though).